Not that long ago, a Philippine president made a bold statement to “beat the odds”. The plan included crushing extremists in the south, ending a decades-old communist rebellion, stabilizing food prices and providing millions of rural jobs. As we all know, none of those bullet-points can be justifiably ticked off the list albeit a peace agreement framework started with the Moro Islamic Liberation Front being one of the few achievements. 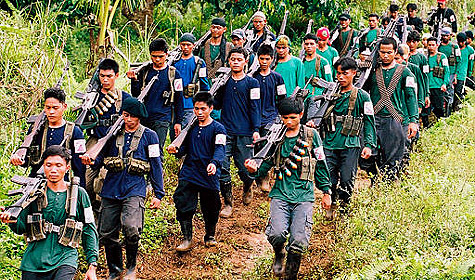 The most worrisome though, is the threat of the communist New People’s Army (NPA) that has not only been stemmed, but is alarmingly gaining ground. 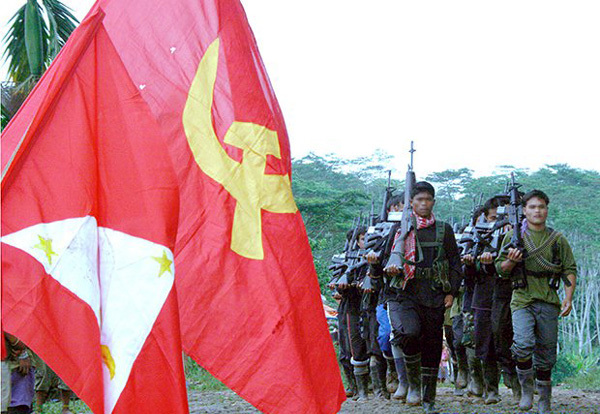 NPA guerrillas march in the background as the infamous Marxist hammer and sickle is displayed. Late afternoon on the 19th of February, an overwhelming 150 communist guerrillas stormed the compound of Del Monte Philippines in Bukidnon. A security guard employed in the compound was killed and two more in addition to one civilian were injured in the attack. What warranted the raid was the company’s failure to yield revolutionary tax, which the rebels require from corporations operating in the province they are based in. Extortionist measures by this group comes as no surprise, particularly as this has been one of their most vital means of financing their struggle since their creation. The most astounding question is this: how did such a large number of enemy insurgents move positions unnoticed by the Philippine military? Surely, intelligence assets would have picked up information especially in a rebel hot spot such as northern Luzon? The fact that the attack was on a multinational corporation is even more worrying, since the Philippines badly needs foreigners to invest to fuel its economic growth targets. Just weeks earlier, on the 27th of January, another noteworthy incident occurred, again orchestrated by the NPA. 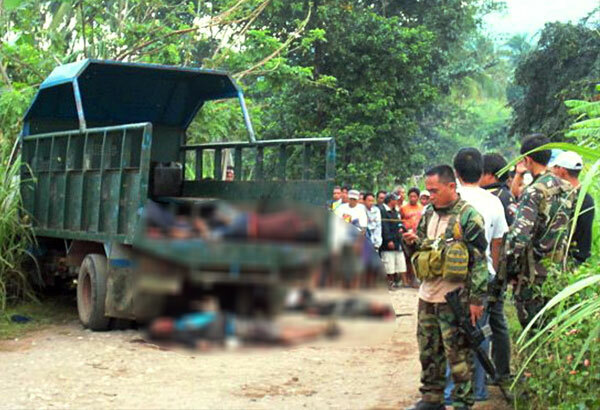 Nine people were killed in an ambush by communist guerrillas on a police truck carrying civilians who had come from duty securing a town fiesta in the city of La Castellana, Negros Occidental. The NPAs claimed responsibility for the attack, but said that it was a legitimate operation aimed at neutralizing police and paramilitary targets. The targets that these rebels are referring to comprised of two policemen, three members of the auxillary military unit Barangay Peacekeeping Action Team (BPAT) and five civilians, three of whom were councilmen of the city. 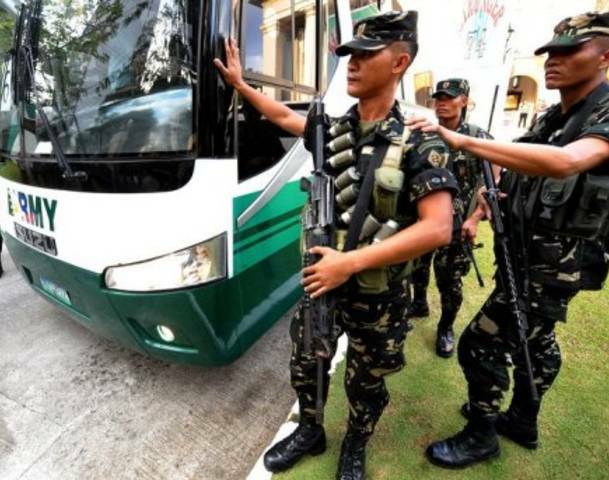 Police who responded to the incident claims that the armed members inside the truck did not even get a chance to fire at the rebels and the injured victims were executed before the NPA fighters fled. It is disturbing to think of the fate these innocent civilians but what is even more hard to stomach is the fact that these rebels had the audacity to hold their own checkpoint at a legitimate urban settlement that is controlled by the government of the Philippines. Have the rebels gained so much strength that they have the confidence to bully legitimate law-enforcement authorities in our own cities? There was a time when the rebels were only limited to the mountains, but today they seem to have found their way into the urban areas in towns and in rural cities around the Philippines. Is this still a petty guerrilla war we are in or have we found ourselves in a full-blown civil war with communists? Bodies lay at the crime scene of a recent communist attack in La Castellana town in Negros Occidental. The previous government of Gloria Arroyo did not produce much results in the war against the communists during her term as president, and her successor the incumbent president Noynoy Aquino was partly elected on ending the conflict with Muslim rebels as well as the communists, but so far he too has failed to live up to that promise. His government has wowed the masses and garnered the respect of his global counterparts by standing up to a giant in communist China in staking our claim of disputed territory; now tell me, how does he expect his campaign to be treated seriously when in his own backyard his forces are being pushed around by ragtag communists? It is a significant coincidence as well that his administration is under the Liberal Party, which is known to have ties with leftist politicians. The LP serves as an umbrella organization to leftist groups like Akbayan and holds ties with Anak Pawis, Kilusang Mayo Uno and leftist-feminist group Gabriela. So it should not come as a surprise when in the wake of the La Castellana attacks not a single statement of condemnation was given by any of these so-called ‘people’s welfare’ parties nor from the politicans who are under them. What is also surprising is that not a great number of people find it alarming that these leftist groups actually hold positions in the national government, as they are armed with their ‘pork barrel’ funds which is loosely abused these days. Only God knows how or on what these leftist politicians spend their tax-funded bank accounts on, but it would be enormously distressing if we suddenly find out that the fruit of the Filipinos’ hard work is what is killing innocent civilians and our soldiers and policemen. An NPA platoon marches in this undated photo. The Armed Forces of the Philippines remain vigilant but are seemingly outdone by their belligerent foes. Immediately after the attacks on both the Del Monte compound in Bukidnon and the police truck in La Castellana, the Armed Forces of the Philippines launched a hot-pursuit operation and put up several checkpoints hoping to apprehend the hostiles responsible for these attacks, but as the old saying goes: this is a mere case of “shutting the barn door after the rats have ran away”. It was merely too little, too late for the military to do anything about these attacks and we can be sure that the communists patted themselves on the back for a string of successful operations in their war against the government. TIME magazine once featured the Philippines’ decades-old war with the NPA on the front page of a 2007 edition of their magazine, on a photo of a married NPA couple is the caption: “The War with No End”. How else would you describe a war that has been waged since World War II and is showing no signs of ending soon? If the government is serious of economic development by attracting investors, it needs to show them that they are ready to exterminate the parasites that have hindered developments in rural areas for decades. The military, too needs to step up the plate. One reason the insurgency does not seem to lose strength is because they have won support over rural populations in several areas of the country. Residents provide them with food, tend to medical needs of injured fighters and provide the rebels with intelligence and even a hideout when on the run from the military. The war will not be won with a culture like this, at least not won by the government. The battlefield does not limit only to the jungles or in the mountains but in the Congress, too, the communists are slowly winning the fight against our democratic government. The NPA are gaining ground in this war, arguably at a rate which is a lot faster than we have seen in recent years. Not to mention, their tactics have become more sophisticated and modern, the government needs to invest more on intelligence and by regaining the trust of the maligned rural people who have lost hope in them and have instead turned to the rebels for help. The Anti-Terrorism Law, which was put into effect in 2008 mandates the thorough monitoring of bank accounts and money laundering which finances insurgents around the world, the government should exploit the law’s mandates to ensure that the rebels bleed their coffers dry and thus paralyzing their operations. Winning this war will not be easy but if the government plays the right cards, it can be done. President Aquino and his government need to reaffirm the people that despite their ties with the left the interests of the people are on top of their agenda. The red flag is rising and communism is gaining strength, his government better make the right play fast. Maoists are sneaky and evil.